In the fast-paced, instant-gratification world of today, children's lack of appreciation and, even worse, a sense of entitlement, have become common complaints. Kids' sometimes insatiable desire for 'more', while barely noticing what they already have, is a typical frustration for many parents. Parenting Consultant Annie Zirkel’s new book, You’ll Thank Me Later: A Guide to Nurturing Gratitude In Our Children (And Why That Matters) gives parents the tools to combat entitlement and ingratitude while instilling the crucial practice of appreciation. Gratitude is not just saying, 'Thank you.' It is about feeling thankful. And beyond basic manners, the benefits of true gratitude are powerful: more optimism, higher life satisfaction, and a greater sense of connection to others. In fact, research shows that children who practice grateful thinking have more positive attitudes towards school and their families (Froh, Sefick, & Emmons, 2008). In You’ll Thank Me Later, Annie offers a wealth of information, ideas and inspiration for encouraging gratitude in our children. This book includes research on why gratitude is important, stories that bring the concepts to life, and suggestions on how to help children combat entitlement and materialism. Annie also addresses the different stages of gratitude from manners through hard gratitude, and the parent-child relationship issues that can encourage or get in the way of making this concept a life-long practice. From actual methods for expressing thanks – in conversation, cards or even the controversial email - to ideas for Thanksgiving Day, on-going gratitude traditions, and the benefits of community service, this easy-read book spells out how parents can help children express and feel appreciation better. Author Annie Zirkel is a parenting consultant, licensed counselor, speaker, and writer based in Ann Arbor, Michigan. She works with families on relationship dynamics, power struggles, and the skills of optimism and gratitude. 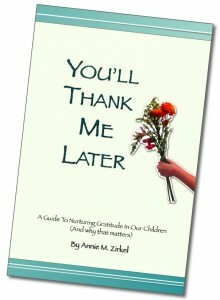 “You’ll Thank Me Later” can be purchased on both Amazon and www.anniezirkel.com. Posted in Gratitude, Products, Raising Children, You'll Thank Me Later Book on November 15, 2009 by annie zirkel.